Palmetto State Armory is proud to off the new for 2018, Ruger PC Carbine. 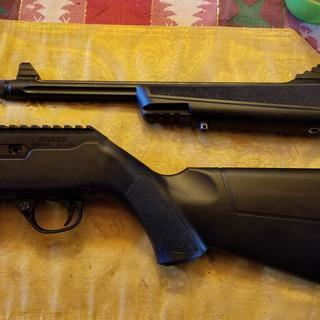 The Ruger PC Carbine comes with interchangeable magazine wells that accept the readily available Ruger and Glock magazines. Ships with SR-Series Pistol and Security-9 magazine well installed and an additional magazine well accepting Glock magazines is included. Easy takedown enables quick separation of the barrel/forend assembly from the action for ease of transportation and storage. Takedown is as simple as locking the bolt back and verifying that the rifle is unloaded, pushing a recessed lever, twisting the subassemblies and pulling them apart. Dead blow action features a custom tungsten dead blow weight that shortens bolt travel and reduces felt recoil and muzzle rise. Bolt is machined from heat treated, chrome-moly steel to ensure strength, structural integrity and durability. Reversible magazine release and reversible charging handle to support ambidextrous use or one-handed control manipulation while maintaining a proper firing grip*. Cold hammer-forged, chrome-moly steel barrel with ultra-precise rifling provides exceptional accuracy, longevity and easy cleaning. The heavy contour barrel provides consistent accuracy, while barrel fluting sheds unnecessary weight and allows for quick handling. 1/2"-28 threaded barrel with included thread protector allows for use of standard muzzle accessories. Accurate sighting system with adjustable ghost ring rear aperture sight and non-glare, protected blade front sight. Soft rubber buttpad with spacers allows the rifle to be properly sized for different shooters or varying levels of outerwear or defensive gear. Durable, glass-filled nylon synthetic stock features sling swivel studs for rapid sling attachment and forward mounted accessory rail to allow for a variety of accessories. Light, crisp trigger pull with minimal overtravel and positive reset utilizing proven 10/22 trigger components. CNC-milled from an aerospace-grade 7075-T6 aluminum billet, the receiver includes an integrated Picatinny rail and is Type III hard-coat anodized for maximum durability. Also includes: one, SR-Series pistol magazine and hex wrenches for rear sight adjustment, buttpad spacer adjustment and charging handle removal. Can you ship this to california? BEST ANSWER: Do yourself a favor and just leave California. Unless the gun is sold with magazines that have a capacity of 10rds or less I don't think this can be shipped to California. Best answer for who??? This is no help. Please delete this answer. It's a beautiful place and we have the right to shoot too. I think there is a CA/NY compliant model without threaded barrel and with a 10rd mag. But not this one from PSA. I left California 20 years ago. Best decision I ever made. Yes. Be sure it’s the 19100 or 19108 models. Both ship with 10 round mags, and are both on the list for CA. You’ll need to ship to your local FFL, once it arrives, head on over, fill out paperwork, then wait for the 10 day / DROS to clear...come back and pick up. Search the list, there are a lot of local and home based FFLs that are former law enforcement, military, etc. that are big 2nd Ammendment folks and I enjoy giving them my business to. While not perfect, it’s what you’ll need to do to legally purchase online and pick up in CA. Not saying I agree with it, just what you’ll need to do. Good luck, it’s a great carbine. PSA could ship to commiefornia if they left out the mags. The question is whether PSA is willing to remove the magazines from the box and ship without the magazines. Everything else on the rifle is CA-compliant, including the threaded barrel. PSA please advise. For the next two hours they can!! BEST ANSWER: For the next two hours they can!! can you use p+ ammo in PC Ruger 9mm carbine ? yes...even works well with subs suppressed. Do you have a 10 round California Compliant? Can this ship direct or do I need an ffl? Can this be shipped with no magazine? There's a 10 round limit for rifles now in Vermont. Can the mag well be replaced on the 19100 so it can take a 10 rd mag? or can the 19100 accept a 10 rd mag as is and it just ships with a 17 rd mag? BEST ANSWER: The top portion of a 10 round and a 17 round magazine are both built the same where it locks into the mag well. The only difference is the length of the magazine body which extends below the mag well. Changing out a mag well will not help with not accepting a high capacity magazine. Does this rifle have last round bolt hold open (LRBHO)? The bolt is held open when the last round in the magazine is fired. Will these fit in a 10:22 takedown bag? PC carbine does it come in .45 ACP? You can purchase a full size Kalifornia compliant magazine that only holds 10 rounds. They just have a plastic spacer at the bottom of the mag, so it is the full size overall. Is it legal in new York? How big is largest magazines? BEST ANSWER: If you install the Glock magwell adapter (included, in the box with the rifle, from Ruger) you can use any 9mm Glock magazine, including the 33 round Glock 18 mag. Can the 19100 be shipped to Colorado? Is this model set up for Glock mags or does require me to buy an adapter? BEST ANSWER: It comes with set up for the Ruger magazines. However it comes with the replacement magazine insert sonitnwill accept Glock magazines. It is super simple to switch. I looked on YouTube and there are tutorials and I did it myself. I've used it frequently and it works great. The rifle comes set up for Ruger's magazines. However, the adapter to run Glock magazines comes with the rifle. It is a relatively painless process to install the adapter and the tools needed are also included. The adapter for glock mags comes with the PC-9. It was easy to convert over to glock mags with the instructions and tools included. It’s a fun little gun many options. It comes with a Ruger pistol magazine adapter installed, and a Glock magazine adapter in the box, with tools and instructions on how to swap them. It is setup for use with the Ruger mags, but it comes with the adaptor for Glock mags in the box. No additional accessories are needed. The adapter comes inside the box included when you purchased the gun and is very easy to change outEnter an answer to this question. A Glock magazine well comes with the rifle. Ruger has a great video on changing from Ruger to the Glock. It’s very easy. Ruger provides an adapter in the box, so yes, you can can use Glock magazines. It is very simple to install. It comes with the Glock mag adapter. Takes a couple minutes to swap. It comes with the adapter in the box, you just have to install it. It comes with the Glock adapter. It comes set up for Ruger mags. You will have install included adapter. Can you shoot NATO 9 mm out of this? BEST ANSWER: Can you shoot NATO 9 mm out of this rifle. Yes you most certainly can. I shoot 115 grain NATO and 124 grain NATO out of this rifle . As for the rifle. It is awesome. I’ve shot over 800 rounds out of my PC carbine and not one problem. This rifle is so accurate it’s unbelievable and my son loves it. If you decide to buy it enjoy it. No such thing as "115 grain NATO". By definition NATO ammunition for the 9x19mm is 124 grain...period. I shot the 9mm 124 gr. police & military load which are like +P or NATO loads and they fired great. My Ruger carbine ate them up. 32 rounds of hot fire. Yes, but I got the best accuracy with Federal 124 grain ball. I have a Sig Romeo 5 mounted which also helps. I haven't shot any NATO 9mm ammo, but as long as it is 9mm pistol ammo you can shoot any weight. Yes. I have shot primarily 9mm ball (NATO) out of my rifle and have had zero misfires or jams. Yes, You can shoot any 9X19 ammunition out of this rifle. Yes. I shoot 124gr Winchester through mine. What Glock mags will it accept? I know for a fact it will use Glock 17 mags. The 17 rd and 32 rd capacities work. I don’t see why Glock 19 mags wouldn’t work either. Glock 17, 19 and 33 round Glock mag all worked fine in mine. Did not try 10 rounder or other manufacturer. I have ran the aftermarket Korean military mags and the see through ETS Glock mags. They have all worked fine with no FTF or FTE. The Korean 50rd drum works good also. Due to the newest Glocks released, this answer should be updated. So, if it can work in a Glock 26, any generation, it will work in this carbine. How many magazines are included? BEST ANSWER: It comes with one Ruger 17rd SR9 mag and a Glock mag well to change and have it accept Glock magazines. Mine came with 1 magazine. Not the Glock variety. One 9mm SR pistol magazine is included. Will Ruger P89 magazines work with the PC Carbine? I didn’t try the Ruger magazine. My main interest in the model was the ability to use Glock magazines. They work flawlessly. Gen5 magazines are the only model that can be released left or right side. No it will not. It will work with the Security-9 Ruger mag or glock depending on the adapter that you install. There is also a Ruger American mag adapter available from Ruger. The PC Carbine will only accept the SR9 and American Ruger pistol clips. It will accept Glock clips as well. What red dot system goes with this 9mm carbine? BEST ANSWER: Many. But I have the Romeo 5 and Tacticon units. Both pair very well with the rifle. I am very happy with the Bushnell TRS-25. When set up for a left hander, does it eject the spent cases to the right or the left? Does this gun except Ruger P series mags? Can you ship to individuals in Georgia? BEST ANSWER: If you have a FFL, and it's legal to own where you are, of course. Is there a muzzle break for PC Carbine 9mm ? BEST ANSWER: The PC Carbine comes with a thread protector on the muzzle, which is threaded for 1/2" - 28. It does not come with a muzzle brake, but there are several available on the aftermarket. Ruger does make the "Silent-SR" but I believe that's only available in .22 LR and NOT 9 mm. Where can I find a suppressor fot my carbine? First things first. This carbine is a blast. I just took it out for the first time, ran 62 rounds of ball ammo through it and it functioned flawlessly. Sights were dead on. It was incredibly accurate at 25 yards and 50 yards respectfully. Clean up was a breeze. Love the take down feature and the bag (same one as the take down 10/22) I bought for it. I moved the charging handle and mag drop to the left side to see if I liked it. The charging handle is going back to the right side but the mag drop is staying on the left. By the way I'm left handed. I am very pleased with this purchase. Get one. So many uses for this carbine. House gun, truck gun, trail gun, etc. This firearm is accurate right out of the box. I like it better than my KelTec sub2000, and I really like the KelTec. You cannot go wrong with this firearm...…..Ruger hits another one out of the park! This rifle does the job. Out of the box I loaded some aftermarket 31 round mags and they all went Boom! No misfires. Used CCI Blazer 9mm x 115. Teardown and cleaning were a breeze. I was very impressed with the quality of the rifle. I didn’t start with the Ruger magazines, I was pleasantly surprised at the ease of the conversion ( helped by Ruger’s instructional videos)! I also installed a red dot sight. The rifle has proven to be not only accurate but fun!!! Love this weapon. Accurate and so easy to clean! The Ruger PC 9 takedown is my new patrol carbine. This weapon is perfect for my applications. As a police officer I have many Glock mags. It is great having a compact package that can be assembled in seconds that works with my side arm and magazines. This carbine gives me extra reach in a portable package. The gun is heavy. I love that. The weight makes it feel like shooting a .22. The barrel is cold forged and fluted. There is top rail for an optic. I like the peep sights. Overall for $449 and free shipping this is an awesome pack/trunk/range gun. If I had a critique it would be that the front sling swivel stud is too close to the forend pic rail. Overall if you have 26/19/17 mags or a 33 round happy stick you will find this carbine fun, useful, and formidable. Ruger has overbuilt this thing to almost perfection. It’s a similar design to the 10/22 but in a 9mm. This is a great fun for new shooters also due to the felt recoil. 2 thumbs up. I would recommend this rifle. The stock seems a bit cheap compared to other Ruger long gun stocks. However, at the price point of the weapon and the fact that it is for plinking, i have no complaints. Well made, love it! Added a red dot to it. Couldn't be happier. Swapped the mag well to glock and put a Sig Romeo5 on it. Rings steel out to 75 yards consistantly. Recoils like a .22 and gathers lots of attention at the range. It didn't like my ETS glock mags so I got the magpul 27 rounders and didn't look back. Do yourself a favor and buy one. I have put about 1000rds through my Ruger PC. Changed over to the Glock mag well. Not one FTF or FTE. It takes all of the aftermarket Glock mags like the Korean ones and the ETS mags, except it has a little problem with the P Mag Glock mags. Runs great with a can and is the perfect compliment to your handgun. I put a Sig Romeo 5 on mine and it works well with the co witness. Wish they would have done it with a Beretta mag well. BTW, this Ruger PC fits in the 10/22 takedown bag. Perfect together. tacticon predator v-1 red-green dot with rail mount at ( tacticon. com ) $30. life time warrenty fired 2000 rounds still zeroed in. Very easy to zero in Don Oklahoma. I bought this gun a few months ago and I Love it! Accurate right out of the box, feeds most anything and the multi-mag aspect is great! I’ve used glock and aftermarket 32 round mags and it shoots great! (Earlier gen. glock mags work, but are tough to seat and you’ve got to remove them with a good tug, but they do work.). No mis-feeds or FTE out of 300 initial rds. Cheap Red-dot optic on top, easy and accurate out to 100 yds! Takedown and reassembly is a breeze! This is cheaper than I paid for mine! I Highly recommend this gun! Shot mine for the first time last weekend. It was just fun to shoot. Very little felt recoil, accurate and easy to bring up and be on target. Great gun, I you are looking for a fun-gun that can serve in other roles I strongly recommend this one! Great little gun. Shot true right out of the box. Did some plinking with it at ten and twenty five yards on soda cans as soon as I got it home. Disassembly and reassembly easy enough. Love the takedown feature. Already got my M&P mags modded to work in the SR-9 mag well. This thing is ready to Rock -N- Roll! Out of the box accurate. Little to no recoil. Fired 3 times at range. Swapped out to Glock magwell. The wife can target practice with ehr Clock 19x and I can use this firearm using same magazines. makes it less to carry. Didn't really think i would like it so much. I do and so does the wife. For her it is very good compared to target practice with a 22. This has more heft/ This is a good value from PSA. Thanks you! Great weapon from Ruger with exceptional service from Palmetto. The Ruger PC Carbine is a great weapon. Just clean, inspect and have fun. The take down makes cleaning a breeze. Oh yes, a little white paint on the front sight fixed my aging eyes. Dealing with Palmetto was a pleasure. Great service and I admire their business ethics. They put a great price on a newly released product and did not gouge the public as some any other vendors are doing. Thank you. takes the place of three guns. A solidly built and pleasure to shoot carbine! Takedown is a snap for compact storage and reassembling the rifle to shoot takes just seconds. The cost is reasonable and I highly recommend this fine Ruger product. It's not the most accurate thing in the world, but then again, who would expect this to make one-hole groups at 600 yards? Rather, it's a fun little plinker that can send lead downrange quickly and with minimal recoil. I had no jams or failures with about 150 rounds of ball ammo used so far. It has some nice features including a replaceable mag well so that you can use your Glock mags instead of the included SR9 mag, stock shims to adjust the length of pull, a threaded barrel and muzzle nut for your "can," and built-in rails for your optics or accessories. I also like the takedown feature. It takes only seconds and makes cleanup fast and simple. You can easily store the two halves in your range bag or a backpack. Highly recommended! Accurate sights right out of the box. Easy take down. Easy to store or HIDE. 33 round glock mags. Get one if you can. Ruger finally got a center fire carbine right. It has the best iron sight set up with integral sight base I’ve ever seen on a carbine. The opportunity to utilize the highly dependable Glock magazines makes this model perfect for a big out, truck, or house gun. Ruger PC9 is excellent choice for pure shooting fun! Changed to accept Glock mags. Shot about 100 rounds of mixed brass and steel case. No failures. Put a Bushnell TRS-25 on it. Very accurate at 25 yards. This carbine is plain fun. Fit and finish is excellent. Take down is easy. I would absolutely recommend this firearm. Better than what I was expecting for Pcc! I will own more of these! River has done it again! I have searched for this rifle for 5 months. Saturday night I ordered it, picked up Wednesday. This rifle shoots extremely well. Its so smooth. I put the glock mag block in. It shot all of my glock mags from factory to korean 50rd drum. There is a review out saying it doesn't like ETS mags but this one shot them just fine. Can't wait to see if Ruger will sell a suppressed barrel. I shot 4 5 shots groups less than a 2inches at 50yds right out of the box with no adj to the sights. Read the manual and adj the barrel but accordingly! This nifty little carbine shoots great. It even cycles with subsonic ammo. No FTF or FTE with any kind of ammo weights. This rifle DOES fit into the Ruger 10/22 takedown bag, even with a optic on it. I have Sig Romeo 5 on mine. It offers the perfect co witness for the Iron sights. Too bad a case does not come with this rifle, but you can get one on gunbroker for like $40. Great little gun and fun to shoot. Iron sight ghost ring sights are dead on. 9mm is cheap. Great price too on Palmetto. CDNN is getting $75 more for same gun.